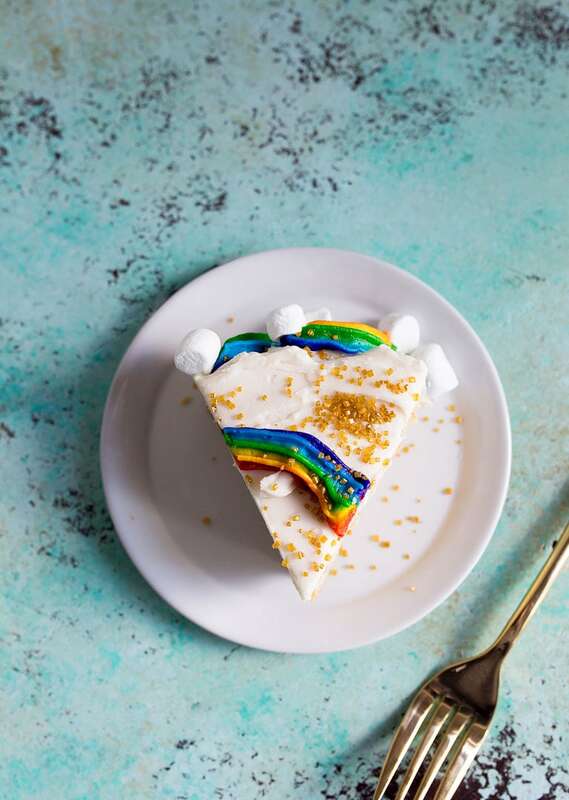 Rainbow Cake Recipe with Marshmallow Clouds and Gold Sprinkles! 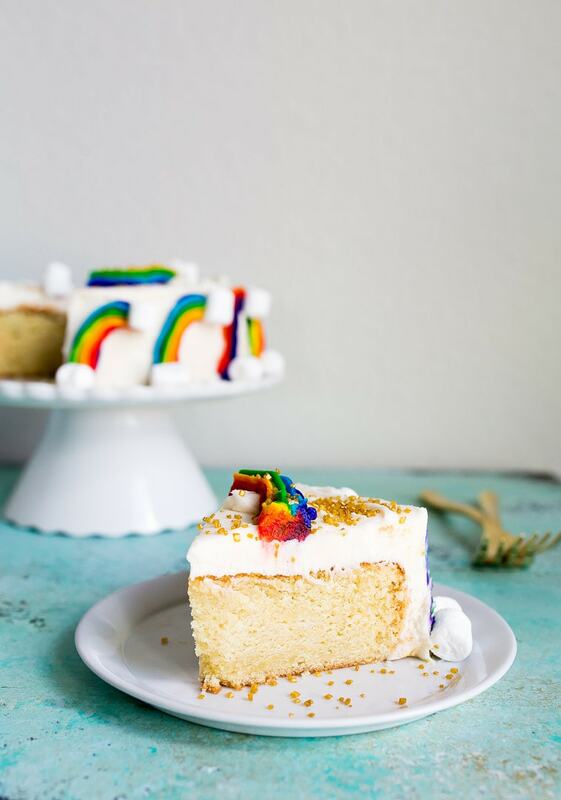 Rainbow cake recipe for a mini vanilla cake with rainbow buttercream and gold sprinkles. We’re about a month out from Camille’s birthday, and we’ve settled on a rainbow themed girl’s birthday party. We are so excited! While I’m making these easy rainbow cookies for the goodie bags, I’ll keep the frosting bag out for this mini rainbow cake. If you make the rainbow cookies, you’ll have about half of the frosting leftover, which is just enough for making this rainbow cake recipe! So perfect, right? No one needs to know that this birthday party requires only one bag of frosting! 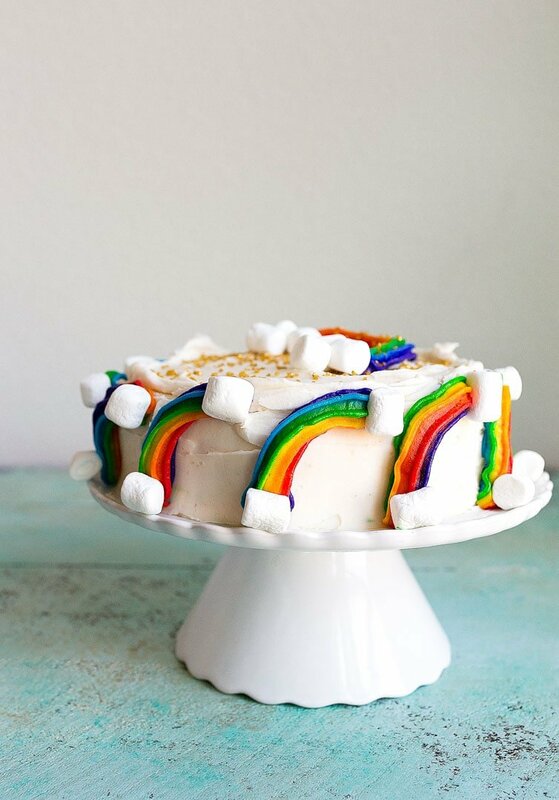 This rainbow cake is really just my easy mini vanilla cake with some piped rainbows and mini marshmallows. Easy, right? Cake decorating is not one of my strengths, though you probably think it would be, since baking is my career. I don’t really have an answer as to why I can’t decorate a cake to save my life; maybe it’s because I’m not a perfectionist? Or, because I drink too much coffee and tea? I just bake a small vanilla cake made in a 6″ round cake pan (you can get them at the hobby store, or use my Amazon link there), and frost it with my super easy vanilla buttercream. After a crumb coat, a 30 minute chill session, and then a final thick coat of buttercream, I set the cake in the fridge to chill. I chill the cake very well before piping the rainbows, because if they come out wonky, it’s easy to scrape the rainbows off a cold cake and start over. If the buttercream coat is the same temperature as the rainbows, they can smear together. So, chill your cake very well first before attempting to pipe the rainbows. I pipe them at an upwards angle because my hands were too shaky to pipe perfect full rainbows. Maybe caffeine is responsible for my inadequate cake decorating skills after all. I finish the cake with mini marshmallows at the end of each rainbow, and gold glitter sprinkles. Camille could hardly contain her excitement on recipe testing day for this cake, and she loved every bite. She picks the marshmallows off first, of course, and requests a slice with at least two rainbows on the end. I can’t say I blame her. Rainbows are just so fun! -I used a Wilton 105 tip. Be sure to see my rainbow cookies post for a detailed explanation how to build the frosting bag for the rainbow swirl buttercream. -If you make the rainbow cookies, you’ll have enough leftover frosting to make this cake–no need to double the recipe! -First, frost the cake with a thin layer of buttercream, ignoring any crumbs; this is called a crumb coat. Chill the cake for 30 minutes. Then, frost the cake with a final thicker layer of buttercream. 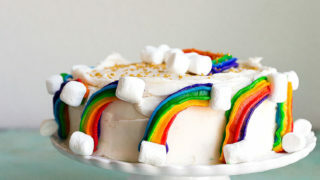 -Chill the cake for an hour before piping on the buttercream rainbows. You’ll thank me if you have to re-do any rainbows. -Mini marshmallows serve as clouds, and gold glitter sprinkles are fun! -Let the cake sit out for an hour at room temperature before serving so the buttercream softens. Mini rainbow cake recipe for a fun girl birthday party. First, make the cake: Preheat the oven to 350, and spray a 6" round cake pan with 2" sides with cooking spray. Line the bottom of the pan with a round of parchment paper. In a medium-size bowl, beat together the butter and sugar with an electric mixer. Beat very well, about 1-2 minutes. Add the egg and vanilla, and beat until well-combined, about 15 seconds. In a small bowl, whisk together the flour, salt and baking soda. Add half of the this to the batter and beat for just a few seconds before stirring in half of the milk and vinegar. Continue beating. Add the remaining dry ingredients and beat, and then stir in the remaining milk. Scrape the batter into the prepared pan, smooth out the top, and bake on a small sheet pan for 37-39 minutes, until a cake tester comes out clean. Let the cake cool on a wire rack in the pan. Carefully remove it from the pan, pulling away the parchment paper once it has cooled. To make the buttercream, beat the butter in a medium-size bowl with an electric mixer until light and fluffy. Add the powdered sugar, vanilla and heavy cream, and beat until light and fluffy. If the mixture seems too stiff, add a splash more heavy cream. Next, frost the cake: use about 1/3 of the buttercream to apply a crumb coat to the cake. A crumb coat is just a thin layer of frosting all over the cake; it will have crumbs and not be pretty, but don't worry. Chill the cake for 30 minutes. After 30 minutes, use the rest of the buttercream to frost the cake. Smooth out all surfaces, and ensure the buttercream is evenly applied. Chill the cake for at least an hour (and up to 1 day covered in the fridge*). 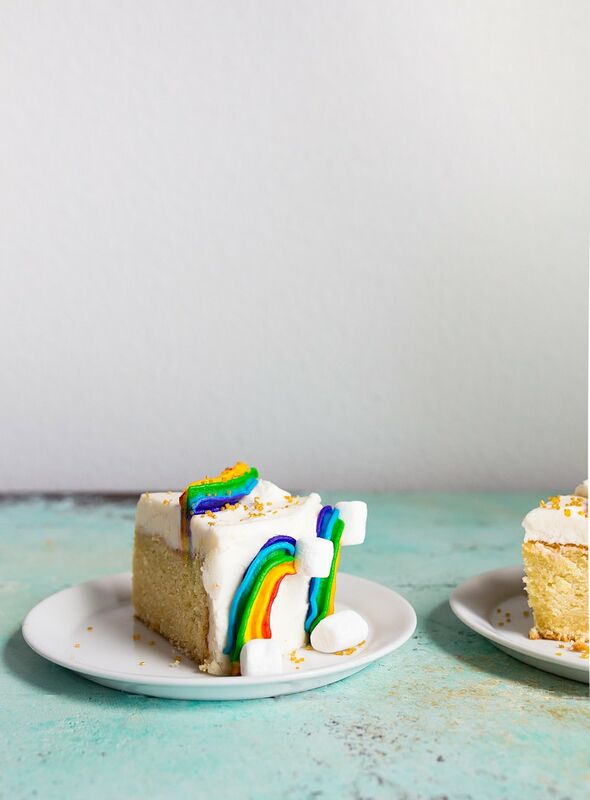 Next, make the rainbows: if you don't have leftover rainbow buttercream from the rainbow cookies, make a half-batch of the rainbow frosting using the recipe linked to in the ingredient list. Assemble the piping bag according to the directions in the rainbow cookies post. Pipe rainbows at an upwards angle about 2" apart all the way around the cake and one larger rainbow on the top of the cake. Place a mini marshmallow on the ends of each rainbow. Sprinkle with gold glitter sprinkles, and serve. *Notes: make-ahead tips are within the recipe; please read through. Cake and frosting can be made ahead of time. Cake can be frozen (tightly wrapped in plastic wrap for up to 1 month; defrost in fridge fully before frosting). Frosting can be made ahead of time and kept in the fridge for up to 1 week. I think this cake is adorable and apparently was meant for me too since it was posted on 4/3, which is someone’s birthday in my house ;) a few years ago I learned cake decorating “the Wilton way” at a local Joanne’s so now another chance to dust off the piping skills! Thanks Camille, keep spreading the sunshine and sharing the rainbows! At first sight when i saw this i decided that, it is going to be the cake on Mother’s day for my mom. The Design is extraordinary and i hope the taste would be same. NIce recipe.thanks for the sharing !! !